A magnesium supplement can be useful in all these cases. Soluble formula: 200 g, 400 g.
Magnesio completo is a food supplement, in tablets or powder, containing Magnesium powder from 4 different sources: pidolate, carbonate, citrate and marine (extracted from sea water with an evaporation process). Magnesium contributes to the normal functioning of the nervous system and muscles and helps to reduce fatigue and tiredness. The formulation is completed by Fructo-oligosaccharides (FOS), a short-chain prebiotic fibre that promotes magnesium absorption at intestinal level. Two doses of Magnesio Completo Principium in powder supply 450mg of Magnesium, that is 120% of the Nutrient Reference Value (NRV) stated by the Ministry of Health. 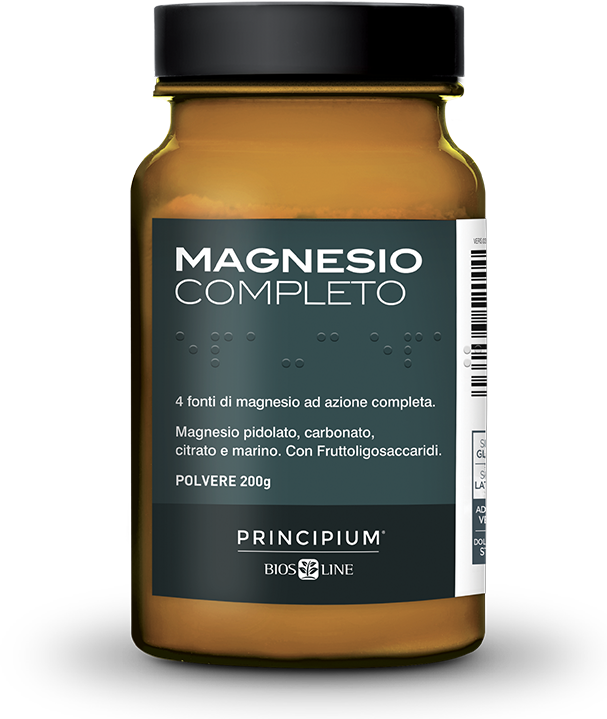 Magnesio Completo Principium is a pleasant and effective solution when there is Magnesium deficiency. It is recommended for the normal functioning of both nervous system and muscles. Moreover Magnesium helps to reduce fatigue and tiredness. Powder: pour the contents of a teaspoonful into a glass of water, better if lukewarm. Mix well and drink. We recommend one or two teaspoonfuls during the day, between meals. Tablets: 1-4 tablets per day with a little water between meals. Marine Magnesium (oxide, hydroxide, sulphate, carbonate, chloride), extracted from sea water with an evaporation process; Magnesium Pidolate, Carbonate and Citrate, Fructo-oligosaccharides. suitable for vegans. Powder formula sweetened with Stevia. Irritability, nervousness, excessive stress, mood swings, fatigue, tiredness, muscular pain. These ailments are often associated with Magnesium deficiency; Magnesium is a very important mineral because it is involved in processes vital for our body health and balance, among which Calcium and Phosphorus fixation in bones and teeth too. Magnesium contributes to the normal functioning of the nervous system and muscles; helps to reduce fatigue and tiredness and maintain bones and teeth healthy. Magnesium is normally available in a lot of food, but an unbalanced diet, incorrect cooking, or particular phenomena such as sport, taking some medication or physiological conditions such as pregnancy, breastfeeding and the pre-menstrual period can cause deficiency. In these cases it might be useful to supplement Magnesium intake with specific products. Magnesium is a mineral (chemical symbol Mg) that plays many very important functions in the human body. In particular, it contributes to normal energy metabolism, normal functioning of the nervous system and normal production of protein; it also helps to keep bones and teeth healthy. Magnesium also contributes to reduce tiredness and fatigue and helps muscles to function normally. The daily intake requirement of Magnesium for an adult under normal conditions is 375mg a day. 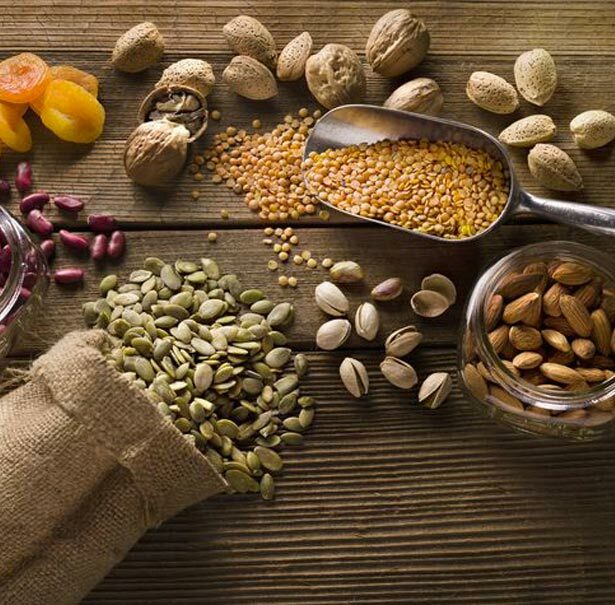 Magnesium is present in many foods, in particular in wholegrain cereals, almonds, pistachios and nuts in general, pulses and green vegetables. A significant quantity of Magnesium is however lost due to food processing, storing and cooking. Magnesium is absorbed in the small bowel and is eliminated in the faeces and urine. Particular conditions such as diarrhoea, taking laxatives or diuretics and diabetes mellitus can inhibit the absorption or increase the elimination of Magnesium. Moreover the Magnesium intake requirement can increase under stress, in conditions of physical exertion or following physiological conditions such as pregnancy, breastfeeding, or the premenstrual period. In all these cases it can be useful to supplement the Magnesium intake to prevent deficiencies. the new high dosage and high titration line. Principium e Magnesio Completo are trademarks of Bios Line S.p.A.